One of the reasons I like films in other languages is the subtitles force a viewer to pay attention. I’m just as bad as anyone else at juggling their technological experiences in the 21st century. I’ve been conditioned by products and my own indulgences to never be satisfied with just sitting still and watching one single thing. While watching football games or movies in English, I can keep up the pretense that multi-tasking is possible, as my attention wanders to whatever device is at hand. I can convince myself that listening provides the same experience as watching, even while my attention shifts completely to a website or messaging app. But not with a movie that has subtitles. If I want to have any sort of understanding of events on screen, I have to read those little lines of translated dialogue or I’m completely lost. Idea: watch movies in English with the sound down so low I have to use captioning. That should keep me interested, right? Blood Glacier is an Austrian film, a first for the October Horrorshow, if I recall correctly. It was directed by Marvin Kren from a screenplay by Benjamin Hessler. The story revolves around an isolated weather research station in the Austrian Alps. In this film, all of our most dire estimates of global warming turn out to be too optimistic. The earth is warming at an apocalyptic rate, and the research station is one of many staffed by scientists monitoring glacial melt. During one outing the scientists discover a red algae-like substance seeping out of the glacier. When this substance is ingested by animals, it births monsters. What we have with Blood Glacier, then, is a monster flick. The four scientists at the station are soon joined by other cast members, bringing the potential body count up to a respectable ten, but looking back, the film could have gotten away with featuring only the original four. The red slime wreaks havoc on the Alpine fauna. Foxes and wood lice create disgusting hybrids. Hawks and insects combine to form bloodsucking amalgamations out of our worst nightmares. A majestic ibex spawns a true horror. The effects team in this film didn’t appear to have much of a budget, but their work was quite good. Most of the monsters are static puppets, but some creative manipulations with the camera and by the cast made it work. 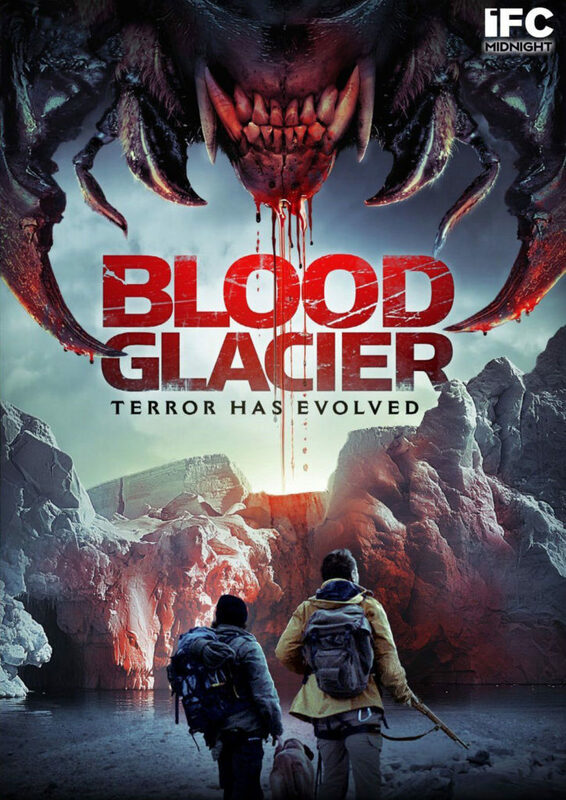 Blood Glacier is a little film. It makes no claims to being an epic, despite being filmed in an epic location. It’s a little light on storytelling, and if a viewer thinks about the science too much it can make Mr. Hessler’s screenplay feel dumbed down for the masses, but the set pieces are excellent. Sometimes horror films can feel like moving from one room to the other in a Halloween-themed haunted house. There is shock, rest, shock, rest, repeat, each encounter slapped together with little thought given to what goes on in between. In different hands, Blood Glacier could have suffered the same fate, especially as the story is not the central focus. But Kren and Hessler did pay attention to the connecting tendrils and ligaments that so many other films ignore, and thusly the transitions from scene to scene work well. The cast consists mostly of unknowns here in the states, but sharp-eyed viewers should be able to pick out Brigitte Kren, who had a role in The Debt in 2010. The lead in this film is played by Gerhard Liebmann. His Janek is not a particularly likable character, but he is the most believable among the cast. At times his mopey demeanor threatened to become too oppressive, but then I realized he was just the best actor in the movie. He was the best at conveying emotion. This is a good horror film. It provides a neat take on the monster subgenre and the Gaia’s vengeance trope. I look forward to the day when the Hollywood bastardization is announced.